Many investors shudder at the thought of investing their money in a company that will experience a slip and fall at any instant. So how do they stay on the safe end (the profit end that is) of their investments? Well, a majority of them rely on calculating business valuation and stock valuation. In fact, it’s clear that this process is critical in helping a company secure healthy investment in the future. Therefore, students pursuing business courses need to be well-versed in corporate valuation through frequent exercises and assignments. And to help you understand better, we offer quintessential corporate valuation assignment help. But before we get into the details of our services, what is your understanding of business analysis and valuation? Well, in simple terms, it is determining how much a company is worth This is done through a variety of methods; e.g. having a look at standard ratios, methods, and tools that will help us determine whether the stock is overvalued or undervalued. Such information is critical in determining how the company will be affected by market instability, financial stress, or merger acquisition! The capitalization of cash flow method – This method is used especially when it is expected that a company will have relatively stable method margins of growth in the future. It analyses a single revenue stream and assumes that it will have growth at a steady rate. The discounted cash flow method – This method is more flexible than the latter, in that it accommodates items that may not remain static in years to come such as variation in margins, debt payments, and growth rates. The Asset Approach – The asset approach of calculating company valuation looks at a business in terms of its assets and liabilities as the building blocks of the business’s value. Because each and every business has assets and liabilities, this is an efficient way to address business value, but we need to have a standard measuring value when doing so. It may sound like a walk in the park, but the challenge comes when trying to figure out the liabilities and assets to be included in the stock valuation, selecting an appropriate bond valuation formula, as well as determining the actual worth of each asset and liability. The Market Approach – As the name entails, this approach relies on the market itself to determine the worth of a given business. One thing we have to realize is that no business operates in a vacuum. Chances are high that there are other companies providing the exact same products and services. For example, if you were planning to buy a business, the first thing you would do is to have a look at ‘other businesses operating in the same market’ to determine its worth. Same would apply to selling the business. NOTE: Both approaches require the calculation of FCF (cash-free flows) of a given company and the NPV (net present value) of the said FCFs. Price/Earnings multiples – Also known as the P/E ratios, this compares a company’s annual income with its market capitalization. EBITDA multiples – Also known as the enterprise multiple, this ratio takes a look at the company’s debt; not taking into consideration other multiples such as the price-to-earnings ratio. 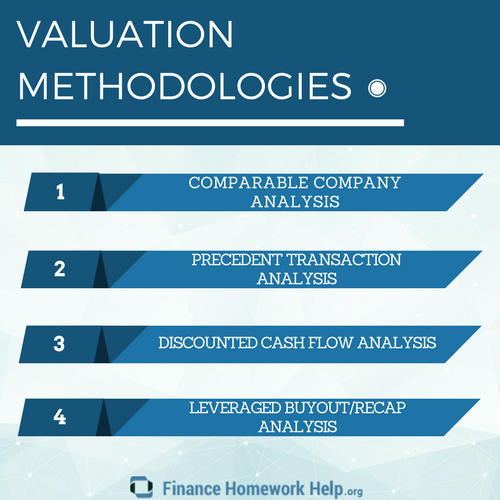 This corporate analysis and valuation method follows the economic rationale of competition. It simply states that in the event that there is a free market, both supply and demand will affect the value of business properties up to a certain balance. This means that the purchasers will not be prepared to part with high amounts for the business, and the vendors themselves will not be willing to receive any that is lower to the value of the commercial entity. This method is actually used when valuing a company that is being prepared for a merger or acquisition. First of all, the parties will have a look at similar transactions that have taken place initially that are somewhat similar to the one being executed. Hence the name comparable transaction. To sell one’s business or company at a good price – Corporate valuation helps sellers determine their company or business’ worth in order to sell it at a profit, or receive a good offer for it. Learn how to calculate capitalization rate now! $2 million/$400,000=5 times earnings. So if your business makes $300,000 in earnings, then its value would be $1.5 million. These are just one of the hundreds of examples that we assist students with every day when it comes to corporate valuation. For more help with the assignment, or for firm valuation homework help, you can contact our customer support team and they will be more than happy to help! So get in touch with us today for the best corporate valuation assignment help and we will effectively handle your order!